A rescuer briefs the press about the condition of the 12 teenagers and their football coach. MEDICAL PERSONNEL HAVE assessed the condition of 12 boys and their football coach as rescuers consider the possibility that they may have to dive for 6 hours to get out of the cave. Heavy rains forecast for northern Thailand could worsen flooding in a cave where the teenagers and their 25-year-old coach are waiting to be extracted by rescuers. The downpours could force authorities to have them swim out through a narrow, underwater passage in the cavern, an official said today. The 13, who disappeared when flooding trapped them in the cave they were exploring on 23 June after a soccer game, were found by rescue divers late last night in the cavern in northern Chiang Rai province during a desperate search. The boys, aged 11-16, and their coach were described as healthy and being looked after by seven members of the Thai navy SEALs, including medics, who were staying with them inside the cave. They were mostly in stable condition and have received high-protein drinks. While efforts to pump out floodwaters are continuing, it’s clear that some areas of the sprawling cavern cannot be drained, said Interior Minister Anupong Paojinda, a member of Thailand’s ruling military junta. Having them dive out of the cave was one of several options being considered, “but if we are using this plan, we have to be certain that it will work and have to have a drill to make sure that it’s 100% safe,” he said. Rescue divers had spent much of yesterday making preparations for a final push to locate them, efforts that had been hampered by flooding that made it difficult to move through the tight passageways of muddy water. A rescuer assured them that “navy SEALs will come tomorrow, with food and doctors and everything.” At the end of the video, a boy asked in English, “Where do you come from?” The rescue diver replied, “England, UK”. He said officials had met and agreed on the need to “ensure 100% safety for the boys when we bring them out”. Cave diver Ben Reymenants, part of the team assisting the rescue effort, told NBC’s Today show that he was “very surprised obviously that they are all alive and actually mentally also healthy”. 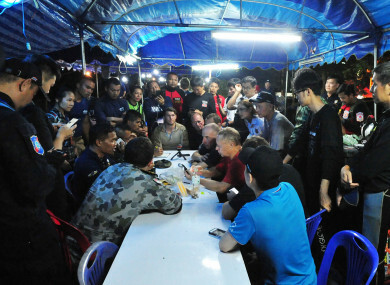 The British Cave Rescue Council, which has members taking part in the operation, said in a statement that “although water levels have dropped, the diving conditions remain difficult and any attempt to dive the boys and their coach out will not be taken lightly because there are significant technical challenges and risks to consider”. Joining the British are other experts from around the world and teams from the US, Australia, China and elsewhere. Email “Medics reach Thai football team trapped in cave”. Feedback on “Medics reach Thai football team trapped in cave”.